It's just what I needed. Tired of items falling in your kitchen sink drain? 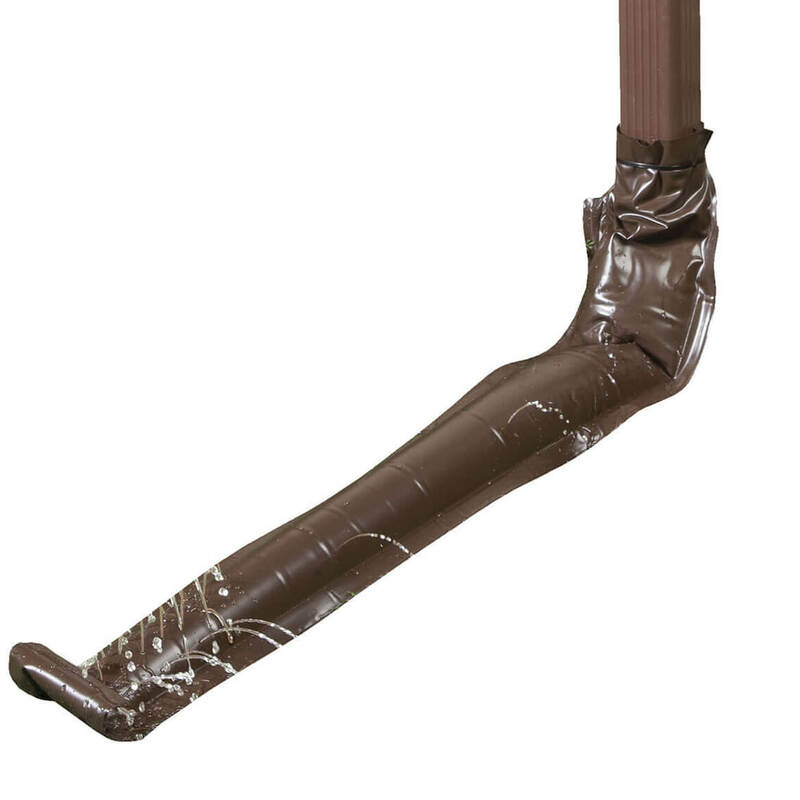 This product will solve the problem and save you alot of time avoiding drain problems. Simply set this is your kitchen sink, light weight and durable. The mesh drain cover catches food before it goes down the drain; it look good; and it was inexpensive. All great things for the price. This strainer really works. I am very pleased. This fit into my double-sink drains. They look good and certainly do the job they are meant to do. Because they are mesh, they keep more things out of the drain than the original ones did. This works really well as a mesh drain cover. I have two mesh drain covers in the kitchen sinks but the "stopper" feature is what sold me. 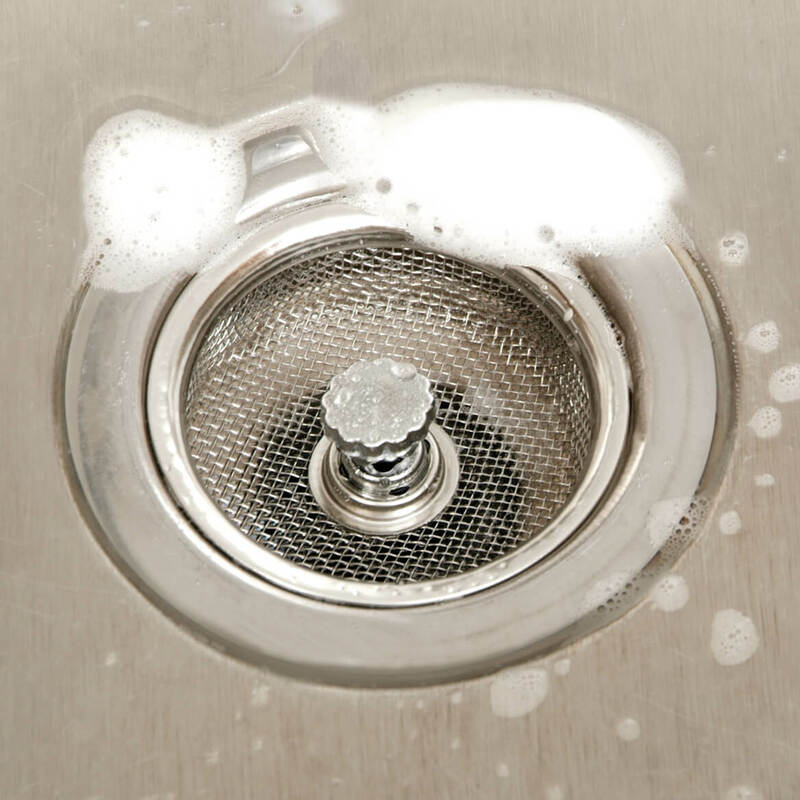 The combination strainer/stopper catches more debris, provides a very good stopper for an older kitchen sink, provides more air flow in the drain to reduce the formation of mildew, and can be cleaned with bleach. I am very pleased with this product. No more worries about items falling into the garbage disposal! Good quality, easy to clean. This helps me catch any food particals from getting down the drain. I have a stopper and a strainer all in one. Thanks for the product. This little screen plug is really handy to have in the sinks. It keeps all kinds of stuff from going down the drain that I would prefer didn't. Like my bracelet that came off while I was cleaning, didn't have to tear the plumbing apart to get it, yea. I don't know if others don't know how to use this properly, but it isn't rocket science. It catches everything it should, no more tilting, so you don't worry about food getting in the drain. Fits my sink perfect...thought they were standard size drains. The mesh is just so much better then the standard slot style. I don't know how many different kinds of these we had by the sink before (My wife would try different ones all the time) but, there are none now. I saw this product and ordered extra for family and all love it, even my wife. I like it because it does what its supposed to do. Fits the drain just right. It does stop food from going down the drain. Much better than the ones that just lie over the drain. kitchen sink holds food particles very well but flimsy construction allows stopper to go down by itself and the stopper does not fit the sink's hole so the water does not stay in the sink. It drains out slowly. Used in sink when giving dog a bath. inside mine & it works great that way. Would have cost more to return, so I used my head!! The drain plug is hard to control! If you do not place it just right, you plug up the water flow when you want to unplug it. Other wise it is okay. It certainly beats your standard strainer/stopper. At least as a strainer. I could not get it to work as a stopper. Not having a garbage disposal, I bought this to help keep larger food particles from going down and clogging the pipes. I am sure it works fine...however...I didn't realize all kitchen sink drains are not created equal and mine is just slightly too large; it doesn't fit so it doesn't hold the water in the sink, though it will still catch food particles. The problem was my fault. There is a small comment about the size drain it fits, I missed that...make sure to measure before ordering. I've tried other drain strainers and this is the best one I've found for my needs. It fits my sink drain perfectly and catches everything from going down the drain. The only thing is that eventually the screen frays and it needs to be replaced. I'm ordering another one right now! The mesh truly prevents virtually everything from going down the drain. Cleaning it is a challenge as with most mesh strainers. Once a significant amount of particles are in the mesh it is easier to clean. Very effective food and waste trapper. It's a good idea. But it's a mess cleaning it. The scraps of food are terribly difficult to clean from the mesh. I purchased the mesh drain strainer and it appeared to be a useful stopper; however; my drain opener was larger and therefore I was unable to use this product. If someone has a small drain opening; it appears to be a useful product. It does not fit tight enough to be able to hold water in the sink. I gave one to my neighbor and she has the same problem. Strains good - but doesn't fit my sink drain well enough to fill sink up with water, leaks badly. Doesn't fit securely in the drain to hold water in the sink. It looked great! But did not fit any of our draines. Will be returning. The strainer portion works well but the stopper doesn't. Water flows out. I think this stopper would work on some drains but the rubber stopper did not fit my sink drain. Works great for catching debris before it can go down the drain. Nice bright drain cover stopper but it does not stop the water when you push the plug down. Poor design. I was disappointed because I have a standard sink and drain and the stopper did not stop up the drain so the water leaked out and did not stay in the sink. I wanted to use the plug in my kitchen sink; however, he does not hold the water in the sink. It's a pretty useless item. I purchased this combination strainer and drain stopper and another type which is only a strainer. I tried this item in two different deep sinks with different designed drains and it stops or severely impairs the water flow with the selector in the up or down position in both sinks. I am going to try to modify it so it at least works as a strainer. Otherwise it is useless unless you just want to dramatically impede the drains flow. They did not fed my drain. Would like this very much if it actually worked. It wobbles side to side and so lets food go around it. The stopper doesn't seal - I can't tell if the stopper is too small or hard, or if the stem is not tall enough for the stopper to seat in the drain opening. The stopper stem is made of plastic silvered to look like metal, and there are burrs and flaws. This didn't fit my sink, so I can not use. Do not fit my sink. My fault for thinking all drains are the same size. Lesson learned. could not use would not fit my sink like it said. Could have bought just a strainer for half the price. The stopper isn't long enough to stop the water, so it is useless. These would be great for the drain if they would stay open. They tend to close by themselves and instead of collecting the mess from the water to be discarded, they fill up the sink with water. This mesh drain stopper does not fit in my kitchen sink drain. 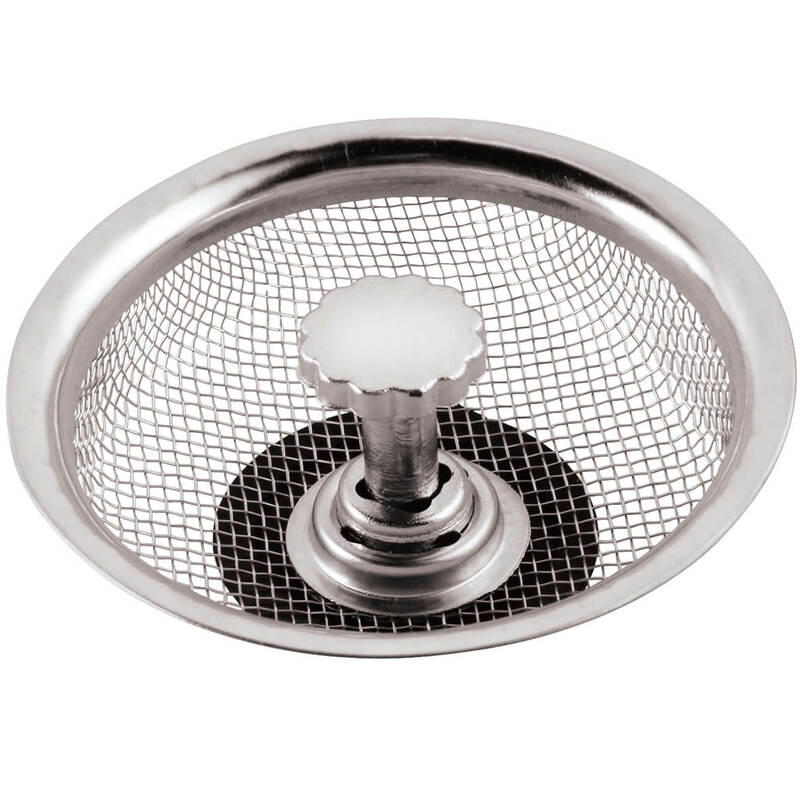 I was hopping to replace my plain mesh drain cover with this one which would allow me to use only one stopper for straining and plugging the sink when I needed to fill it with water but the styles are not compatible. I also thought the overall quality was less durable than I expected. Did not fit standard kitchen sink drain! I would not suggest buying this product. This product didn't fit properly in the sink. But the upside is you can still use it to catch the larger food. The plug often comes out and won't stay in the water until you are finished washing your dishes. Broken when received seemed flimsy, do not know if it would have worked, not worth paying return shipping. I purchased this to use in my sink. First time I used the stopper part to fill the sink it fell apart and was never able to use it again. Needless to say it went in the garbage. And I will never buy it again. Great idea, but stopper is too small and does not fit any drains in my house or my daughters. Item does not fit well in sink drain, clogs very easy, does not plug drain as it is supposed to do. Threw it away and bought one at Publix. they aren't what they look like. they are by far to flimsy. Iam not happy with this do not whole the water in my sink. Mesh drain cover- NOT GOOD! Item did not function as described . Did not fit correctly. Stopper did not even reach. the idea of having a mesh strainer and drain plug was very attractive to me. I already have the mesh strainer for the drain, however, while the screen fit the drain, the rubber plug did not and thus it was useless for that purpose. doesn't fit all sinks properly? didn't fit my sink so didn't stop as it said? Work great to keep gunk out of drains. Also not available in stores. We remodeled our kitchen over the summer & our deep sink has drains w/ wider holes, so we need a mesh stopper to avoid any clogging... thank you for 10% OFF/FREE shipping! Every bit counts. Used this product before. Words very well. It suddenly occurred to me that if I put these over my drains in the kitchen sink I may have cleaner sinks! What a novel thought to be having at the age of 51! Thanks Walter Drake! With you around, the minutiae of the house can be dealt with! Wanted a mesh strainer that also had a stopper - these are difficult to find in local stores now. I ordered these before and I'm reordering..they catch so much stuff that would end up in my drain pipes. I recommend these to everyone. They work great but some I bought have sharp metal prongs that hurt my fingers. Because it is both mesh and has a stopper. Because it has a stopper. I had previously bought one from a store to try it and see if I would like it. Oh my! Best thing since sliced bread. Love it. Could not find another in all of my shopping around. I decided to try internet and to my surprise I found them. Please continue this item. I am trying to find one that fits my drain and think this is the one. With small children there is always food or something in the sink. So my drain does not clog up as much. Have one in bathtub that is great. The one I am purchasing is for kitchen sink. This Drain is a 2 n one. Been looking for a drain like this ..
not easily found and a great idea for those of us not using the dishwasher. My last one wore out. I think this will be a better solution to my sink drainer. My bed slips off the frame at the halfway point, thought I'd give these a try. I HOPE they work for my bodys sake! So my drain empties without clogging. To strain out food from my sink. will this work with a disposal unit? BEST ANSWER: Within the size limits, I don't think there would be a problem. Note that the diameter is 3 1/4 inches. Most disposals have openings larger than that. Only used on opposite side of sink. The disposal has it's own cover. Works quite well with disposal unit.